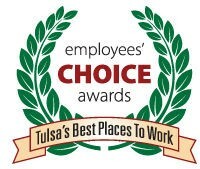 GableGotwals was selected as one of 15 outstanding businesses to receive the 2014 Employee Choice Awards: Tulsa’s Best Places to Work based on recommendations from employees. “These employees took the time to fill out our survey and recommend their place of business for the award.” Says Lesa Jones, Editor of the Tulsa Business and Legal News. The Employee Choice Awards is not based upon third-party evaluations, profits, growth or customer satisfaction. Instead, employees rated their employers on a five-point scale in terms of work/life balance, fairness in promotion, time off and other areas of consideration. Altogether, these results generated an overall satisfaction rating.